Check weather forecasts and travel concerns prior to departure. Dress for the season and not for the day. Know how to use a map and a compass. Leave it as you found it so others may enjoy it as well. When boating, always wear a PFD. Be prepared to stay out overnight. Even a short trip can become lengthened (a survival situation) due to unexpected circumstances such as bad weather, injury, disorientation, etc. ALWAYS CARRY THE ESSENTIALS. To help you survive and enjoy the great outdoors, it is important to learn basic first aid and outdoor survival skills through programs such as those offered by North Shore Search and Rescue. Expert knowledge and guidance is important in any outdoor activity. When you want to take a hike, always be aware of your route and follow safety procedures. These tips can keep you safe and give you a memorable outdoor experience. Check that your equipment is complete and working properly prior to your departure. Stay within sight (or constant contact) of one another and designate a meeting time and place in the even that you get separated. Purchase a good quality compass and a map of the area you intend to explore. Learn how to use them by contacting your local search and rescue team. Pay attention to your surroundings, landmarks, time & distance, and always look back the way you came. The trail looks different from every angle. Remain calm and control your fears. Becoming lost is not dangerous if you are prepared. Remember the acronym S.T.O.P which means Sit, Think, Observe, and Plan. S.T.O.P. as soon as you become aware that you are lost or in distress. Statistically, persons who keep moving when lost go far away from trails, roads, searchers, and a happy ending. If boating, stay near your boat, even when it has capsized. Alcohol and drugs affect clear thinking, coordination, and reaction time. Remember alcohol will also accelerate the onset of hypothermia. Blow a whistle, light a fire, and stay visible to assist searchers in finding you. Three of anything (whistle blasts, fires, rock piles, or gunshots) are internationally recognized as distress signals. Remember that animals are startled by and not attracted to your signals. Don't be fooled into thinking that you could never be lost. With proper preparation, you can enjoy your outdoor trip. Anyone can become a hero, but not everyone is prepared to become a volunteer. Are you ready to serve the community in times of emergency? Become one of our friendly volunteers! Don't worry if you feel you aren't qualified since we train members. 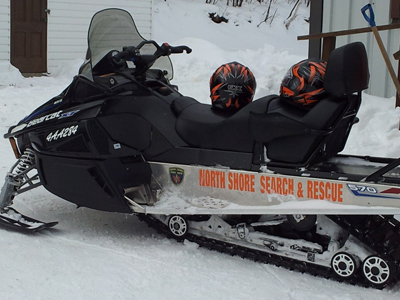 For more details, contact North Shore Search and Rescue at (705) 869-8587.